I had a dear step dad who passed away May 2017. Before he passed, he had started teaching me how to play the guitar. I've ALWAYS wanted to learn how to play an instrument, and he had previously owned a music shop. He could play anything with a string! I was pretty excited when he started teaching me, but sadly we only enjoyed two lessons together before he fell too ill to continue. I was left his guitar, and longed to learn how to play it. That's when Guitar 360 Method came into my life. They blessed me with the Semester 1 Bundle which includes 5 weeks of Absolute Beginner bonus content plus the 13 weeks of Semester 1 content. Semester 1 is taught by Krisz Simonfalvi, and it's good for both beginners and those with experience. If you are brand new to learning to play, the the 5 weeks of Absolute Beginner are really great! I have to admit, this took more of an emotional toll on me than I had imagine it would because my step dad had wanted to so badly to be the one to teach me to play. As a result, I found myself distracted at times and I had to move more slowly through the first few lessons. Back when my step dad was teaching me, I had practiced on my own at home enough with the two chords I had learned that my fingers had started to toughen up a bit. That all left (LOL) from lack of practice, so I was reminded again of my sore finger tips during the first several days of practicing lol! I started out with the Start Playing Your Guitar section. I like the camera angles, and I like that I can stop, rewind, and replay as needed to get it. I like that I can fully see what is going on, and where my fingers need to be. I'm very visual, and I need that obviousness in order to succeed. I also like how it is all so easy to navigate. You mark each thing complete as you finish it-which I usually don't do because you know me, and I'm a fail when it comes to marking complete haha, but if you want to you can do that, and it keeps track for you. I also like how there's a different section for both left hand and right hand, so you know what each hand is supposed to be doing. Like I said, it's broken down into very easy to follow lessons, which is great for me. The visuals are my favorite part! This is exactly the kind of thing I need. I can see this, I can pause it on my screen, and I can take my time to make sure my fingers are exactly right. This is where I have had issues before because no one had ever taken the time to show me exactly where my fingers should go in a way that made sense to me when it comes to the chords. I spent years in choir or show choir in school, so I'm not stranger to music, notes, and scales. But when it comes to playing an instrument, that's pretty foreign to me. I think my background in music has helped since I have a basic understanding of what is going on, but I don't feel a musical background is necessary to understand this program. As of right now, I've managed to get out of the beginner phase, and I'm well into week 3, nearly week 4. Like I said, I'm moving more slowly so that I master each area first. I had never even heard the term Solfege before! Actually, I never even know the origins of the Do-Re-Mi scale! I really love the history that is also included in this course. Actually, Mr. B is now really interested in Hungary (featured in this week's lesson,) and that has led to more research into the country! This lesson has helped my understanding so much! By simply moving up and or down on the frets, you change the key....but your hands are still doing the same thing. I don't know why my mind had complicated that so much! I found the Guitar 360 Method to be unique. I liked how everything is broken down. The Start Playing Your Guitar part is really great. I wasn't really taught the parts of the guitar, or anything like that. I was just taught how to hold it and the finger positions for a few chords. This part really goes into detail on the basics including the parts of the guitar, how to tune it, and a 4-Finger Warm-Up (which I needed!) Beyond learning the basics of the guitar, you'll also learn some chords here and even learn the parts of a song (like the parts of speech in a sentence lol) I spent a lot more time here because I had a hard time getting my fingers to get it right. I want to be one of those cool people who can just play without looking, and that is taking some time for me. 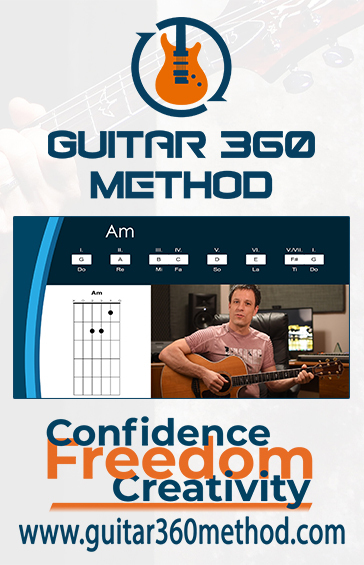 The Guitar 360 Method is great for me because it's a creative approach that is teaching the whole in segments that just make sense for me. Like the beginner part, the Semester 1 weeks have the same easy to navigate layout. I love being able to pause, or replay, as needed to help myself really learn. I'm not sure if I'll finish in the allotted time frame of the subscription because I spent so much time trying to master the foundational aspects, but I feel as if I will complete enough of it to have a MUCH greater understanding so that I can continue with great ease! 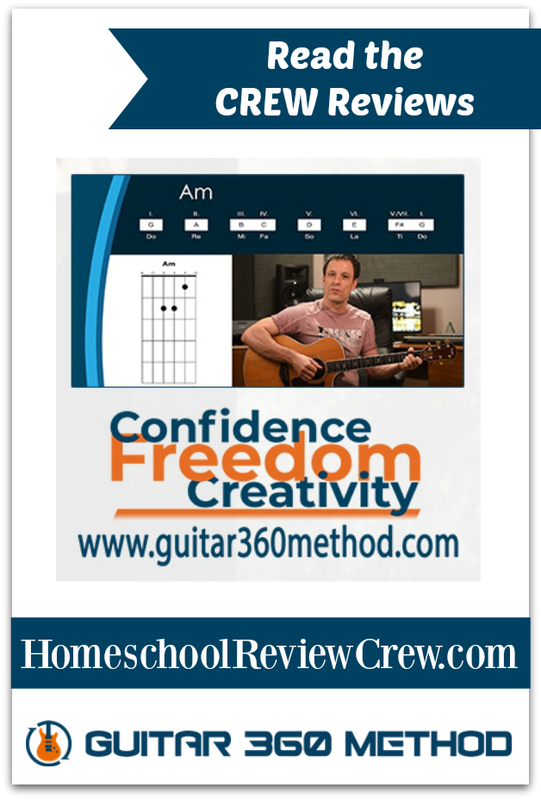 We are only 1 of 50 families to review Guitar 360 Method. Please click the banner below to read more of their reviews!